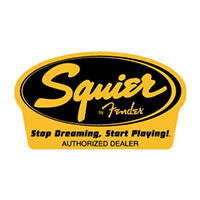 Squier Affinity Series basses represent the best value in solid-body electric bass guitar design. The Squier Affinity Series J Bass features a rosewood fingerboard, two single-coil Jazz Bass pickups and a top-load bridge in Brown Sunburst. If you have any questions, give us a call or stop by to check out and save on a new Squier Affinity Jazz Bass at Ken Stanton Music today.